The Omusati region of Namibia has the second-highest HIV prevalence in the country, standing at 17.4%—higher than the national average of 13.1 reported in 2013. Decreasing the HIV prevalence and improving pharmaceutical services for antiretroviral therapy (ART) in Omusati—and the country as a whole—is therefore a goal of the Ministry of Health and Social Services (MoHSS). With funding from the President’s Emergency Plan for AIDS Relief (PEPFAR) and support of the USAID-funded Systems for Improved Access to Pharmaceuticals and Services (SIAPS) Program, several interventions were developed at the national, regional, and health facility levels to improve treatment for HIV patients. One such intervention was strengthening the scale-up and training of pharmacist assistants (PAs) by the MoHSS National Health Training Centre (NHTC). NHTC has itself seen great success in recent years. With SIAPS Program assistance, an average of 25 PAs have graduated annually since 2012—a significant increase from the average of eight graduates in earlier years. SIAPS Program helped to provide technical assistance to NHTC to establish a quality management system for the PA training, enhance the skills of the tutors in facilitating, moderating and assessing students’ learning, establish a skills training laboratory, and orient the students on the use of the EDT for capturing information on ARVs dispensed to ART patients. Cumulatively, 126 PAs have graduated since 2012, when SIAPS began supporting NHTC. Many of the PAs have gone on to provide much-needed support in underserved areas of the country, including the Omusati Region. As of June 2015, 97% of the 36 public health facilities visited during the annual pharmaceutical supportive supervision visits had a qualified PA providing ART and other pharmaceutical services. A PA tracer study completed in 2015 with SIAPS’ support revealed that PAs are providing pharmaceutical services and some are solely responsible for the health facilities with no pharmacists. 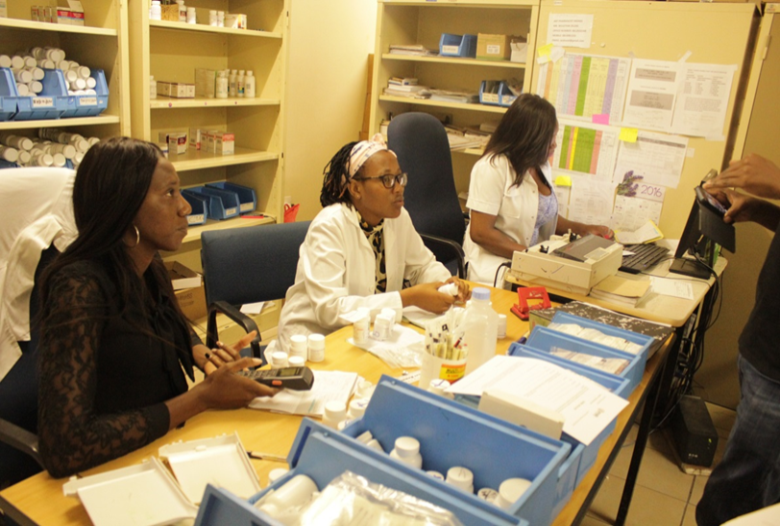 Oshikuku, Okahao and Outapi district hospitals located in the Omusati Region of Namibia are highlighted cases of hospitals which have benefited from the NHTC PA program. PAs who have graduated from the program are now working at the ART Pharmacies in the three district hospitals. They are responsible for patient data management, ARV dispensing, and inventory management. Albertina Shikongo, who graduated from NHTC in 2012, currently serves as a PA at Outapi District Hospital. Her facility can serve up to 300 patients on ART daily. “As you can see, we have long queues outside but in a short period of time the queues will be gone,” she said. Final-year NHTC PA student Ruusa Aron assisted PAs at Oshikuku District Hospital while on a six-week training assignment at the facility. 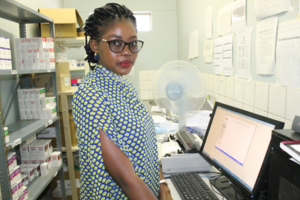 Aron was trained by SIAPS on how to use the Electronic Dispensing Tool (EDT) in December 2015, which enabled her to use the tool to register patients receiving ART, record the specific antiretroviral (ARV) regimen dispensed to the patients, set up appointments for the patient for the next prescription refill date, and manage the inventory of ARVs. She applies the knowledge and skills gained from the NHTC training in her practical attachment at Oshikuku District Hospital.